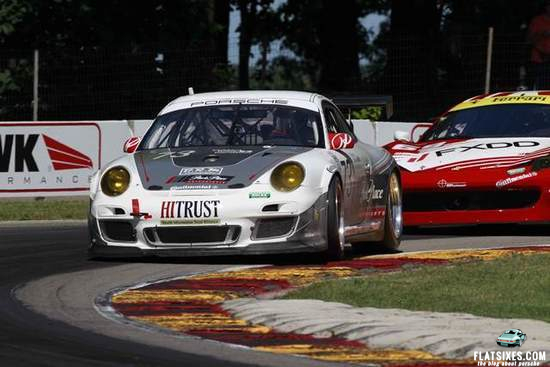 Park Place Motorsports earned its second consecutive GRAND-AM Sports Car Series podium tonight. The Porsche customer team repeated the second-place performance in the two-hour and 45-minute SFP Grand Prix at the Kansas Speedway with their Porsche 911 GT3 Cup car. The second Porsche customer program, Magnus Racing, entered the weekend leading the GT team and driver championship chase but after debris punctured the car’s radiator, they fell to eighth in the race’s final standings and to second in the point standings. Park Place Motorsports driver and team principal Patrick Lindsey (Santa Barbara, Calif.) took the green flag fifth on the GT grid in the No. 73 Porsche 911 GT3 Cup car and held to strategy in the race’s early going. He turned the Porsche over to Patrick Long (Playa del Rey, Calif.) with just over two hours remaining in the race. Long joined the field after quick pit work by the Dallas-based crew and shortly thereafter took the lead. America’s only Porsche factory driver held the top position until the eventual race winner, the No. 63 Ferrari of Alessandro Balzan (Italy) and Leh Keen (Charleston, S.C.), moved to the point. A late race strategy call to only fuel the No. 73 and not take new tires helped close but not overcome the gap to the leader. The team’s performance guaranteed them their third podium finish of the season. The day was longer for the Magnus Racing team. Owner/driver John Potter (Salt Lake City, Utah) started the race and turned over the driving chores to three-time GRAND-AM Rolex GT champion Andy Lally (Dacula, Ga.) at the same time the No. 73 made their driver change. Once in the car, Lally charged as high as sixth playing the team’s strategy that has paid off with nine top five finishes in ten races this year. With less than half the race remaining, multiple Daytona Prototype (DP) class cars tangled in the infield. The incident left debris in the racing line. Moments after the accident, Lally, unaware of the debris laying on the track, drove over it puncturing the No. 44’s radiator. The crew made repairs in a remarkable nine minutes returning to the race in ninth place, six laps down to the class leader. Lally was able to gain one position on the last lap of the race earning the team vital additional points in their championship chase. However, it was not enough to hold the lead entering the last two races. Magnus Racing leaves Kansas with a one-point deficit to the No. 63 Scuderia Corsa Ferrari 458. Park Place will have the next chance to earn its first GRAND-AM victory and Magnus its chance to recapture the point lead, September 8 at Mazda Raceway Laguna Seca in Monterey, Calif. A rebroadcast of this past race can be seen on FOX Sports 1 at 4 p.m. ET, Sunday, August 18.